The Sri Lankan air force is looking to further expand its fleet and purchase a new batch of Russian military helicopters, according to reports on Sunday. Sputnik reports Sri Lankan ambassador to Russia Dayan Jayatilleka as saying the new helicopters would be used in UN peacekeeping missions. "There is a commission that discusses the purchase of Mi-17 helicopters," said. 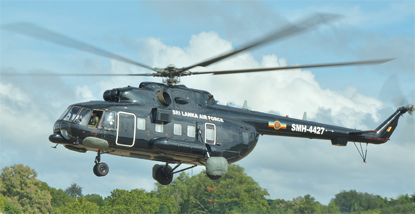 The Sri Lankan military has been purchasing Mi-17 helicopters since at least 1993, according to a military website, with the helicopters regularly having been deployed in military offensives that have killed civilians. In one such massacre, the Navaly church bombing of 1995 that killed over 140 Tamil civilians, survivors recalled hearing “eight explosions ring out as the helicopters flew past” on the day of the attack. The Sri Lankan security forces have continued to purchase military equipment, including helicopters from Russia, despite the armed conflict ending almost a decade ago. Increasingly they have been used for commercial ventures by the armed forces, as well as being deployed on a peacekeeping mission in Sudan. 17 August 2011 : Why is Sri Lanka buying more military transport helicopters?